Adrian Lisle and Ryan O’Neill both left high-flying careers in politics and law to pursue their passion to start their own fashion and accessories empire. They met at university in the UK, and after graduating embarked on careers in politics and corporate law. Both Ryan and Adrian soon became disillusioned with corporate life and wanted an outlet for their creativity. In 2007, sensing an opportunity in fashion and design, Adrian and Ryan teamed up to launch their brand, Lettuce, creating women’s scarves and handbags for high-street retailers. After gaining a reputation across the UK, they launched Lettuce in Australia in 2009 in David Jones stores, and have now expanded into over 600 Australian boutiques. Sales for Lettuce grew from $200,000 in 2008 to over $3 million by 2014. With Lettuce underway, Adrian, Ryan and Ryan’s sister, Tammy who lives on the Gold Coast, were keen to expand their retail offerings. The dynamic trio came up with the idea to create a smart phone to keep kids safe in 2014. The idea came from Tammy’s experience with her now eight-year-old daughter, Tallulah. As soon as she could walk, Tallulah developed a frightening habit of running away in order to get her mother to give chase. Tallulah, not knowing the possible dangers, saw this as an exciting game, however it drove Tammy to despair. Ryan saw first-hand the stress that his niece’s disappearing acts caused, and this was the inspiration to create the Moochies phone for kids. The name Moochies evolved from the belief that Moochies would allow kids to ‘mooch around’ and wander without worry. “We wanted a name that would make the product attractive to children. We believed that the biggest difficulty that parents would face is to convince children to use something that parents believe is necessary for their safety. If a Moochies watch could be made to sound and look appealing to children, then half the battle would be won,” says Adrian. Moochies is a two-way communication tool that caters to children aged 3-12, who are too young for their first mobile phone, but puts parents’ minds at ease knowing that they can get in touch with their child if they need to. The phone is worn like a watch to stop children from losing it, and connects to an app on the parents’ phone so they can pre-set numbers to make and receive calls from. Parents can also use their app to set boundaries for their child and check on their whereabouts. The phone can only make and receive calls from authorised phone numbers, so there is no threat of contact from strangers or social media being used unsafely, which is an ever-growing risk for pre-teens with mobile phones. After a year of development, the self-funded brand Moochies, was released in Australia and the UK in October, just in time for Christmas wish lists. Adrian, Ryan and Tammy strived to create a product that would be the most practical and functional for both parents and children, with timeless styles that can span across different age groups. 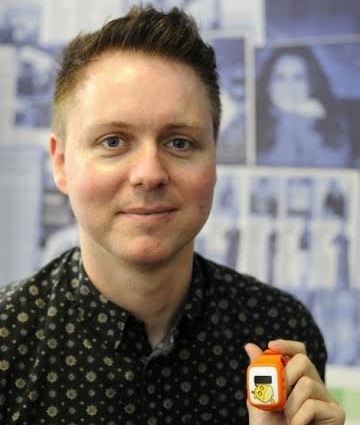 The team are continuing to create digital solutions to make parents lives easier, their next project is a wearable-thermometer for babies that parents can monitor through an app to check for fever and illness.